The pictures below were taken at the Simcha on the Square on Sunday 17th September 2006. 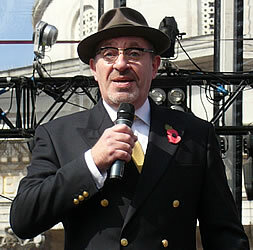 This event celebrated Jewish music and culture in London's Trafalgar Square. 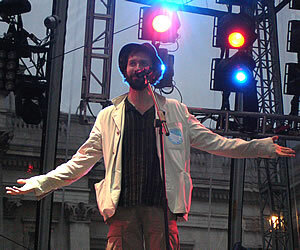 Simcha is a Hebrew word meaning "joy", and also refers to the celebration of a happy occasion. 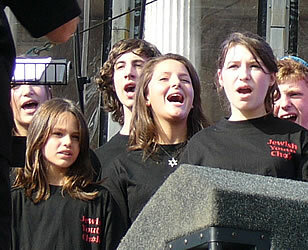 This event took place shortly before the Jewish New Year (known as Rosh Hashanah), which is in September or early October and in 2006 is on 23/24 September. About a week after the start of the new year is another Jewish festival known as Yom Kippur. 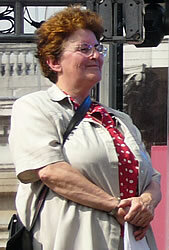 In 1290 the king Edward the First told the small Jewish community that had settled here to leave England. It was not until 1656 (in the time of Oliver Cromwell) that a decision was made to allow Jews to settle here: from this time they could own property and could openly worship in synagogues. 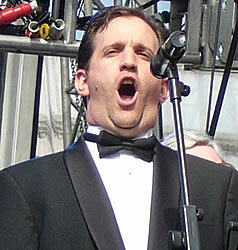 2006 is the 350th anniversary of this decision. 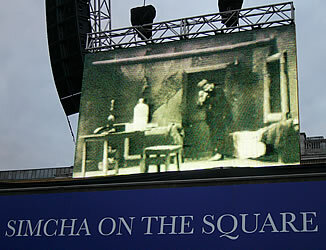 Acts at Simcha in the Square were introduced by comedians Sol Bernstein and Mark Meier, and by Laoise Davidson (the Head of Communications at the Jewish Music Institute). 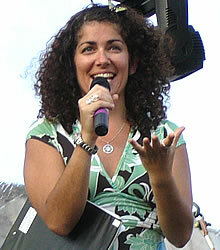 Neshama performs at many Jewish celebrations, including at weddings, Bar Mitzvahs (coming of age ceremonies for young men, aged 13) and Bat Mitzvahs (similar celebrations for teenage girls). 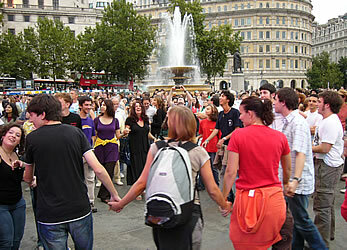 The band encouraged the audience in Trafalgar Square to dance along to the music. 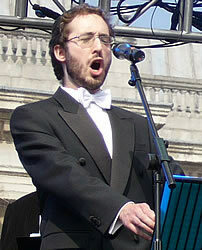 A cantor is a professional singer who leads prayer services in a synagogue. 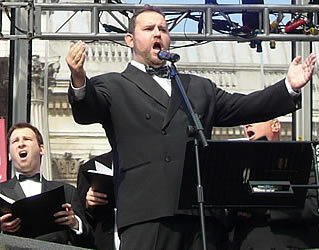 This performance was given by three cantors (Steven Leas, Jonathan Murgraff and Gedalya Alexander) and the London Jewish Male Choir, which in 2006 celebrated its 80th anniversary. 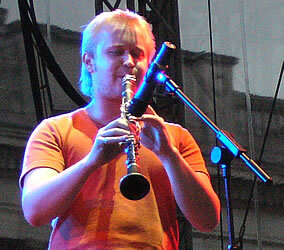 Klezmer is a popular style of Yiddish folk music (originating in central and eastern Europe). 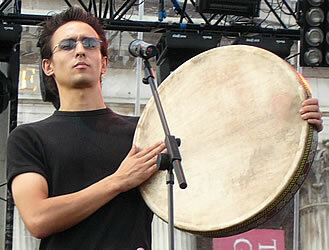 People usually hold hands when dancing to this type of music. 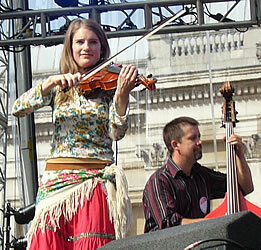 She'Koyokh Klezmer Ensemble is a London-based group who perform mainly traditional melodies from Poland, Romania and the Ukraine. 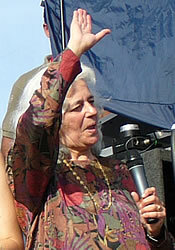 The opening ceremony was led by Geraldine Auerbach, the founder of the Jewish Music Institute and one of the main organisers of this event. 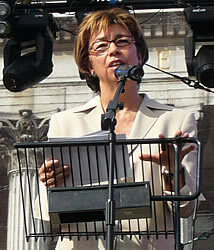 The Deputy Mayor of London Nicky Gavron (who is a Jew), gave a short speech. 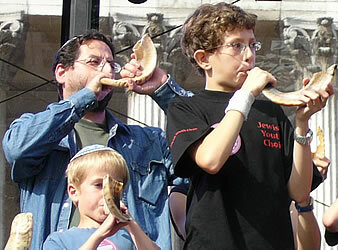 A shofar is a ram's horn, used as a musical instrument at Jewish religious ceremonies. 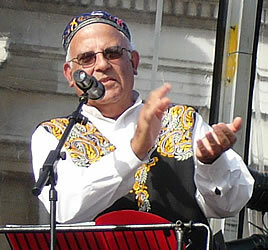 A group of men and boys went onto the stage and blew into their shofars to celebrate the Jewish New Year. 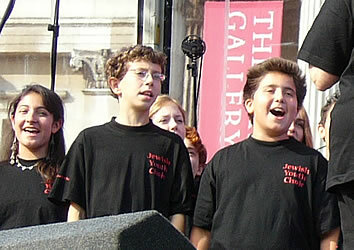 The Jewish Youth Choir is made up of Jewish children in London who are aged between 8 and 18. 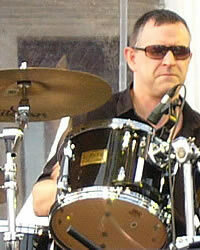 Their performances on the stage were conducted and arranged by Vivienne Bellos. 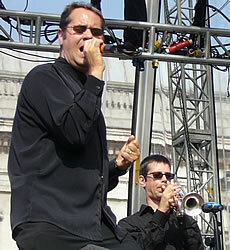 Rivers of Babylon performed songs of praise in the Jewish-Babylonian (Iraqi) tradition. 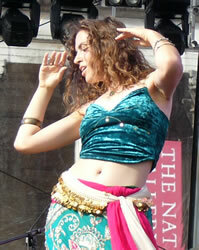 They were joined by guest dancer Deborah Rosenberg. 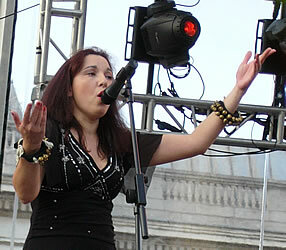 Mor Karbasi writes and performs in the Ladino language. 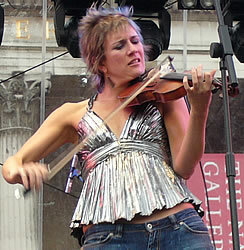 The last of the songs she performed on stage ("Judia") was written after she visited the site of the Nazi concentration camp at Auschwitz in Poland: it is dedicated to the memory of the many Jews who were murdered during the Holocaust. 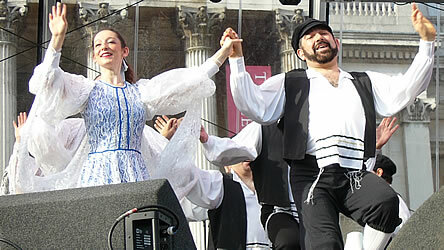 The Oranim and Nitzanim dance troupes performed on stage in a range of traditional costumes representing the various Jewish traditions. 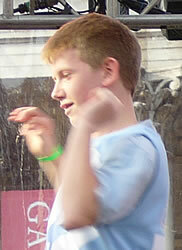 One of the highlights was a dance to one of the songs from the film Fiddler on the Roof. 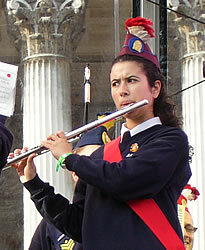 The Jewish Lads & Girls Brigade (JLGB) is a British youth organisation for young Jews. 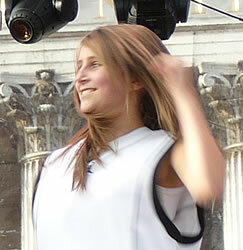 Following performances of music and marching there was some modern hip-hop dancing. 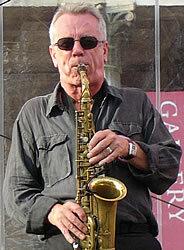 Ronnie Scott was a Jewish jazz musician from East London who died in 1996. 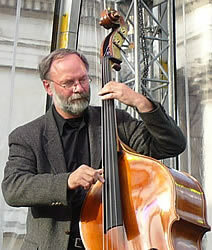 Ronnie Scott's Jazz Club in Soho, opened in the 1950s, is still the leading venue for jazz in the UK. 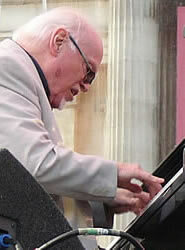 The Ronnie Scott Legacy Band was formed shortly before his death and keeps alive his style of performance - John Critchinson, on piano, played with Ronnie for many years. 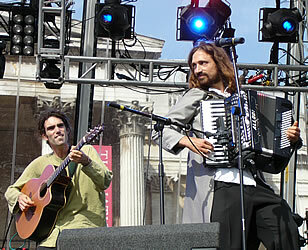 Los Desterrados perform music orginating from the Jews who were expelled from Spain and Portugal during the Catholic Inquisitions in the 15th and 16th centuries. 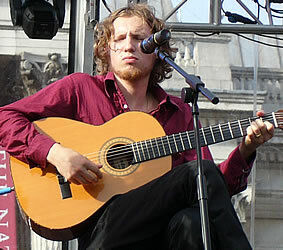 The songs are sung in their original language, known as Ladino (a old form of Spanish mixed with Hebrew influences). 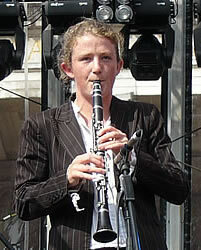 Sophie Solomon is a violinist who was a founder member of the band Oi Va Voi and has recently started a solo career. 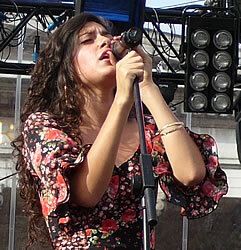 Her music is influenced by a wide range of styles of world music, and is performed in a lively and passionate way. 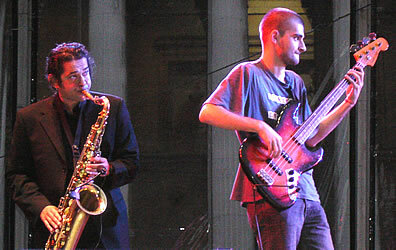 The Sound and Light Cinematic Duo perform Klezmer-style music to accompany old East European films which show Yiddish life. 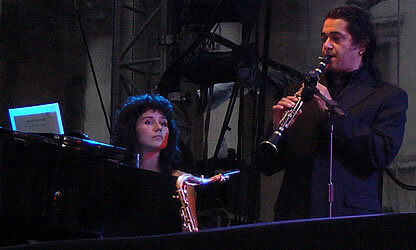 Merlin Shepherd performed on the clarinet, and Polina Shepherd on the piano. 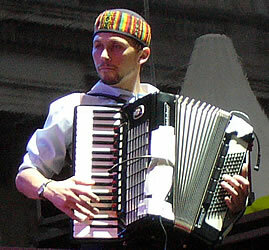 Nayekhovichi are known as a "Klezmer rock band". 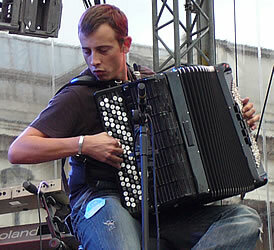 They flew in from Russia to give the final performance of the day.